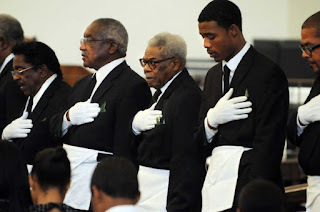 As a Lodge Secretary, I can tell you that one of the most important duties I perform is reporting the passing of a Brother to the Brethren, and when the family requests it, helping to organize the Masonic Funeral Rites. I wanted to tell you a story about an experience I had a few months ago that demonstrated just how important Masons take this final responsibility to our Brothers. I received notice one evening some months ago that one of our members had passed away. He was in his 90s, and hadn't been to lodge in years. Only a few of our members were old enough to remember him, but Masonry had been a very important part of his life in his younger years and he'd been very active in the lodge, and in the Shriners. The family requested the Masonic Rites performed after the visitation (that's generally how its done where I'm from), and we were happy to do so. We never have a problem turning out a good showing for the Masonic Funeral Rites. In fact, we have a regular group that performs the Rites with great skill. 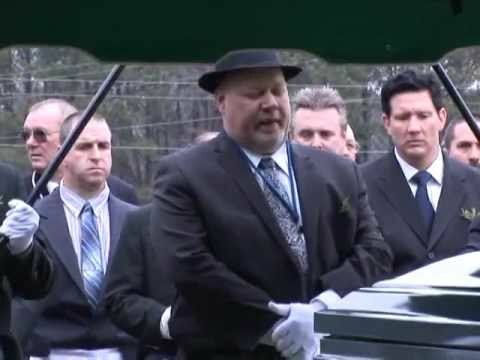 If you've never seen a Masonic Funeral Rite, it's probably one of the most emotionally moving and meaningful ceremonies you're ever likely to see. In addition to the Rites, the family needed some help with another detail. They wanted to know if I could line up some pall bearers as well. It's a wonderful thing to live a long and active life, but one of the costs of living so long is that very often you outlive all your friends, much of your family, and sometimes even your children--and that was the case with this Brother. There just weren't enough close friends and family left. The funeral was during the day, and during the middle of the week. To be honest, I was a little concerned about the request when I first agreed to line up six Masons. We're a small lodge in a small Midwestern town. I knew most of our members who would be available for the funeral weren't much younger than the Brother who passed away, and those who were able worked during the day. I put the word out to Masonic Lodges far and wide that we needed pall bearers because I knew it was going to be tough to find able-bodied Masons during the workday. But I was completely wrong about that. I needn't have cast my nets so far and wide--within an hour I had my six lined up and about another dozen on standby. We wound up with the Master of the Lodge, Treasurer, three 33rd Degree Masons, and an Assistant Area Grand Master as pall bearers--and three of the six missed work to attend. That's how important that obligation is. I learned something from that experience--I wasn't taking that responsibility of a Master Mason seriously enough. It's easy sometimes to skip a Masonic Funeral Rite by saying "I didn't even know him" or "it's been a long day." But that Rite isn't just for the departed Brother--it's for the family. 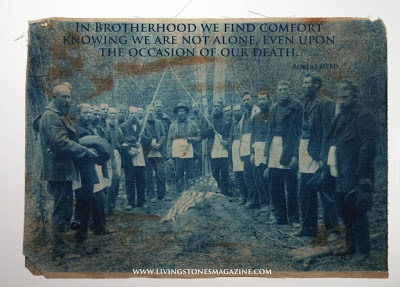 And in those cases where the Brother lived a very long life, it can be very meaningful to those family and friends that remain to see this large group of Masons show up dressed in suits and wearing white aprons and gloves, many of which never knew the deceased, and perform this touching tribute in his memory. It leaves a long and lasting impression on them. It's not a task, and it's not a chore--it's an honor. And it's comforting to know that when our time comes, the same will be done for us. As my new friend and Brother Robert Herd said, "In Brotherhood we find comfort in knowing we are not alone, even upon the occasion of our death." I'd like to thank Bro. Robert Herd and Living Stones Magazine for letting me use his graphic quotation at the opening of the article. I'd just about finished this article when I saw it on Facebook, and realized it would be a perfect compliment for this piece. I contacted Bro. Robert Herd and asked his permission, and as expected, he basically said "what's mine is yours, Brother." 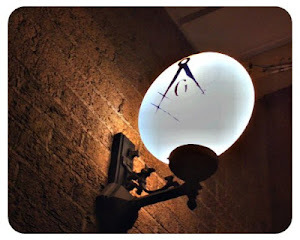 Todd E. Creason, 33° is the original founder of the Midnight Freemasons blog, and author of several books and novels, including the Famous American Freemasons series. He is member of Homer Lodge No. 199, and a Past Master of Ogden Lodge No. 754 (IL). He is a member the Scottish Rite Valley of Danville, the York Rite Bodies of Champaign/Urbana (IL), the Ansar Shrine (IL), Eastern Illinois Council No. 356 Allied Masonic Degrees, and Charter President of the Illini High Twelve in Champaign-Urbana (IL). He is also the author of the blog From Labor To Refreshment . . .